There was another craze during the 1970s: custom vans. People would take full-size vans from Ford, Chevrolet, and Dodge and trick them out with shag carpet, a stereo system, custom paint and wheels, custom interior, CB radio, and even accessories like mini fridges! “Vanning” exploded in popularity and was featured in movies and songs of the era. Like vinyl records and most things from the 1970s, “street vans” fell out of fashion to fade into obscurity, only to see a small revival today. This 1970s-era Dodge Ram van may be a relic of that era. 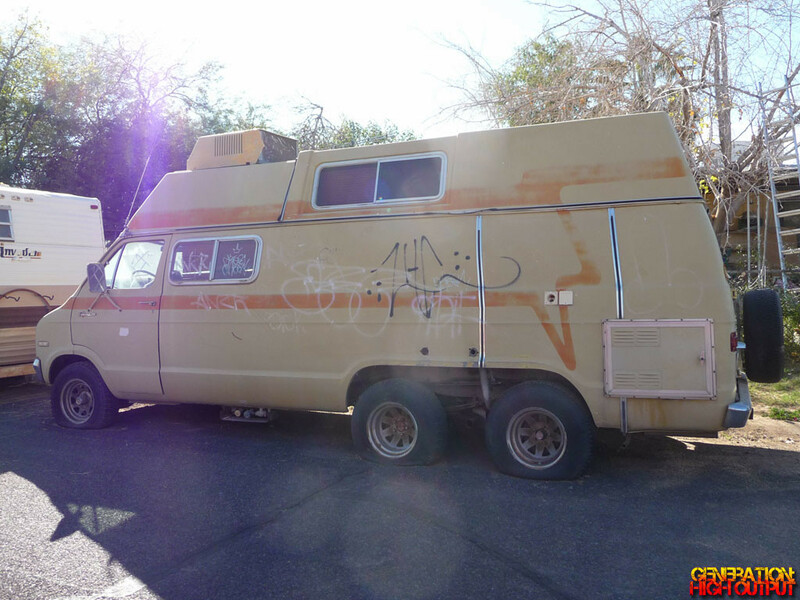 It looks to have been converted to a camper/motorhome at one point, and is now languishing on a side street. The interesting thing about this van is its dual rear axle setup – something I have not seen before and can find very little about on the Internet. I suspect it may have been a custom modification. This entry was posted in Curiosities and tagged 1970's, Custom Van, Dodge by Trevor Freeman. Bookmark the permalink.